Retailers Hope For Strong Holiday Season As November Sales Beat Expectations : The Two-Way Retail and food sales were up 5.8 percent in November over the same time last year, the Commerce Department said. Retailers are hoping for their best year since before the economic recession. 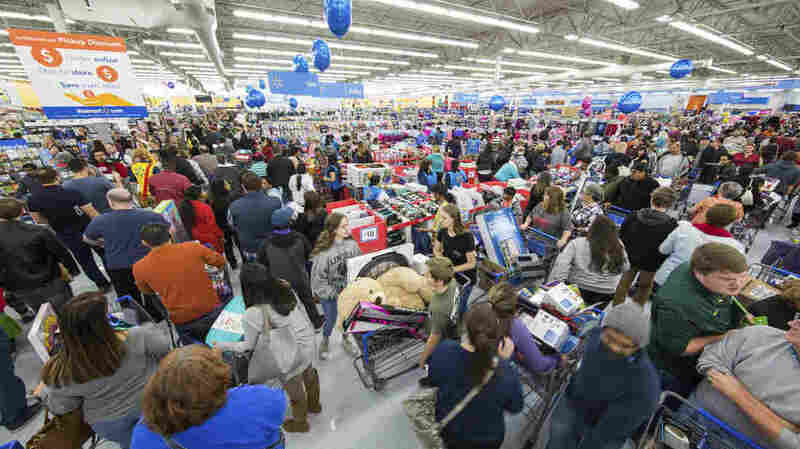 Shoppers fill a Walmart on Thanksgiving day in Bentonville, Ark. Sales in November were up from last year. "This has been an impressive start to the holiday season, perhaps the best in the last few years," Jack Kleinhenz of the National Retail Foundation said in a statement. The group, which represents retail stores, released its own similar estimates Thursday. "The combination of job and wage gains, modest inflation and a [healthy] balance sheet along with elevated consumer confidence has led to solid holiday spending by American households," he added. According to The Wall Street Journal, economists had predicted only a 0.3 percent increase in sales for November. Also in November, "nonstore retailers," a group that includes online vendors, had sales up 10.4 percent over November of last year and up a seasonally adjusted 2.5 percent from October 2017, according to the Commerce Department's estimates. Sales were up 2.1 percent over the previous month at electronics stores and 1.2 percent at furniture stores, the agency reported. Surveys show customers are the most confident they've been since 2000, according to The Associated Press. The most recent unemployment report from the Bureau of Labor Statistics put the country's unemployment rate at 4.1 percent in November, the same as it was in October. It's the lowest unemployment rate since before the economic recession that began a decade ago. In a sign of confidence in the economy, the Federal Reserve raised interest rates this week for the third time this year and the fifth time since the economic crisis. Though to add some caution to the optimism, the Journal noted that strong spending "is outpacing income gains, meaning Americans are saving at a slower rate, which could lead to a spending slowdown later or the threat of rising debt levels." The newspaper also said that "high inventories and a slowdown in purchases by international tourists amid a rising dollar" contributed to a poor holiday season for retailers last year. The National Retail Federation said sales for this year's holiday season, which they define as November and December, "are on track to meet or exceed NRF's holiday sales forecast for an increase between 3.6 and 4 percent over last year."